Does a beautiful leather bag bring out the bag-addict in you? Don't worry we totally understand this affliction because we've spent countless minutes window shopping outside those fancy bag shops (wondering why we don't have a single friend who would gift one to us). So, when we spotted this hidden lane that starts and ends with bags, we knew we had to share it with you. We were walking down from Grand Arcade towards Indian Museum and had come to a stop near The Bible Society (marvelling at its new facelift) when we spotted this narrow, little (and almost hidden) lane. From the mouth of this lane (it starts with Govind Stores) to its narrow tunneled tail, all we saw were bags! There were bags of different style, looks and puposes; and we knew just then that we were in bagstopia! 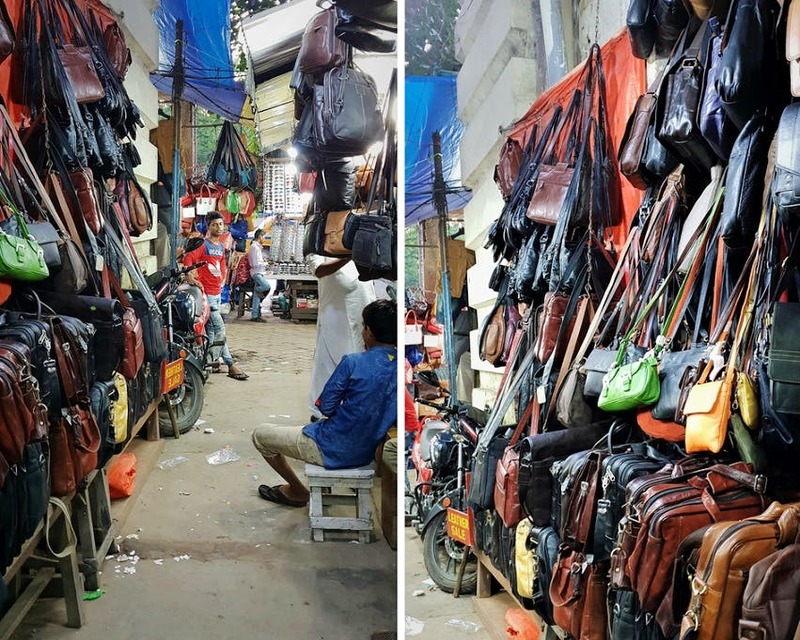 A lane lined with pure leather bags, we found small purses, (Baggit-like) hand purses, (Hidesign-like) sling bags, totes, laptop bags, duffles and so much more. A complete lot of export surplus rejects (so, don't be surprised if you stumble upon bags from popular brands), these look shabby at first glance, but wait until you give them a good polish. We were amazed by the range of colours we found here--from olive green to cherry red, mustard yellow and burnished orange! The amazing collection aside, what makes this hidden treasure land totally awesome is the dirt cheap prices these the bags are available. Don't hesitate to haggle because we've bought bags here for as cheap a INR 200! You've got to have a good eye to spot the hidden gems here. We found a leather bag that had Kashmiri embroidery on it, and fell in love with a brown leather satchel that would totally amp your hipsta look!